We have had so much going on lately I haven’t been on here for a while. I’ve got so much to talk about! 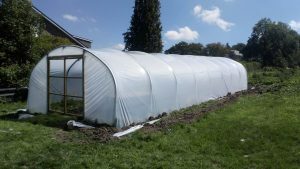 With the help of our brilliant volunteers we made the most of the sun and managed to finally get the polythene on our massive tunnel. It needs tidying and finishing but it looks great , there were a few pretty tense moments mind, but we’re dead chuffed it’s done. 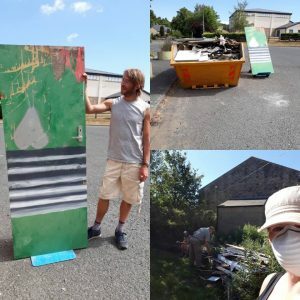 Last week we had our Medway Clearance day and filled a skip will all kinds of rubbish including, as I predicted, many copies of Le Bibliobus and Tricolore from the old french classroom and the iconic grafitti door. It is now almost ready to decorate so there will be a few volunteer days coming up to do this soon watch this space for details and get in touch if you’d like to help out in any way, any help is appreciated. This morning the heatwave finally broke and we have some rain thank goodness. 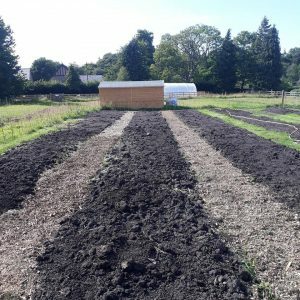 We’ve been simultaneously loving and cursing this endless sunshine because we’ve had so many new plants to bed in and our recently planted trees are suffering. We only seem to have lost a lovely Acer and a Silver Birch sadly, but that appears to be all, thanks to Sam’s recent purchase of a 90m hose! 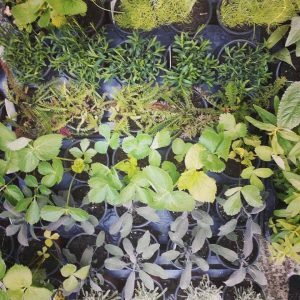 We’re in the process of finishing our physic herb garden which includes lemon balm, creeping thyme, wild strawberries, angelica, cotton lavender, fennel and many other lovely things. It’s still very much a work in progress, there are now pathways and features including a geometric experiment with box trees….it might just work! we’ll see. Today’s job is chipping all of the willow and brash that our volunteers cut back last month. 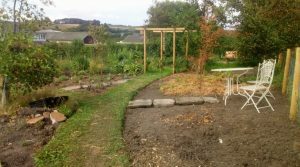 These chippings will be used as mulch and also we’re collecting chippings from elsewhere to make the pathways between veg plots. We are two down with seventeen to go……. 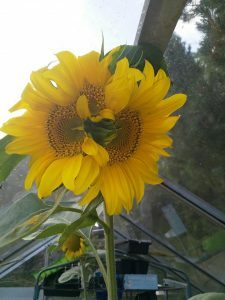 And finally, the contenders for the sunflower growing competition are coming in thick and fast. 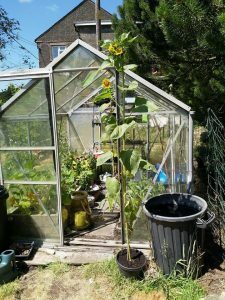 These Russian Giants really do live up to their name, I’m so impressed with the photos that have come in so far – one has even outgrown it’s greenhouse. Results will be announced on 1st September, it’s going to be a close one.